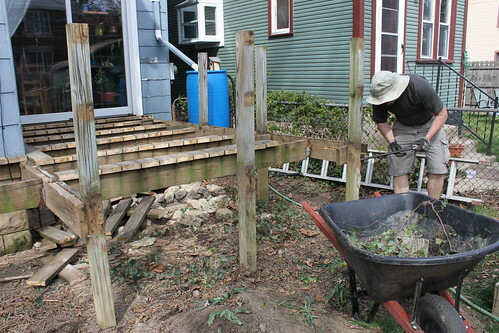 The deck was torn down. Lucky for us, the builders were poor at concrete setting and posts came out fairly easily. They also used subpar techniques for covering the crawl space and we got to replace wood on the sides of the house; not so lucky. 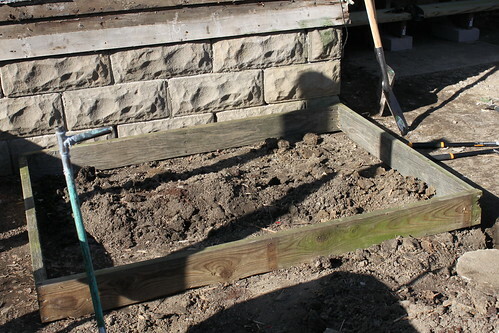 I built a raised bed from some reclaimed deck wood. And I took a crummy picture. The sun was setting and I was TIRED. Our hens gave us three eggs yesterday. 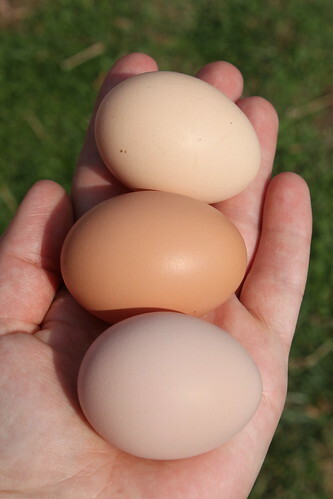 It's fascinating to me that each breed has a different egg shape and color. From top to bottom, these eggs are from the Sussex, Australorp, and Orpington breeds. 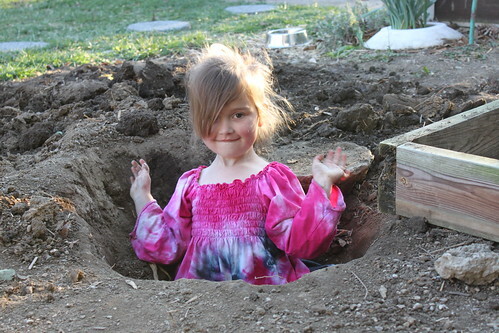 Lil played in a post hole. Why not? 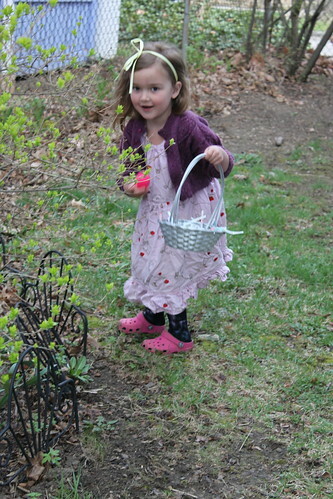 Lil and the dogs hunted for Easter eggs this morning. 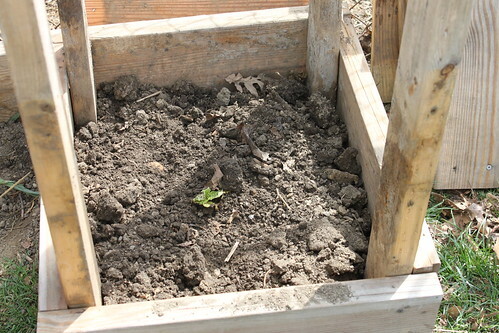 We planted one potato tower, two potato buckets, and one straw bale potato bed. We have even more seed potatoes to plant in our rented plot. 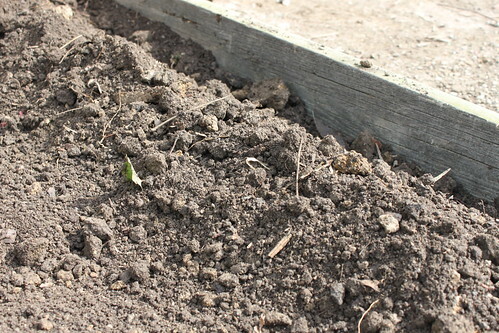 I dug furrows and planted three asparagus crowns in the new raised bed. I also tucked three crowns into the strawberry bed. I'll write more about asparagus later because it's a fascinating plant. 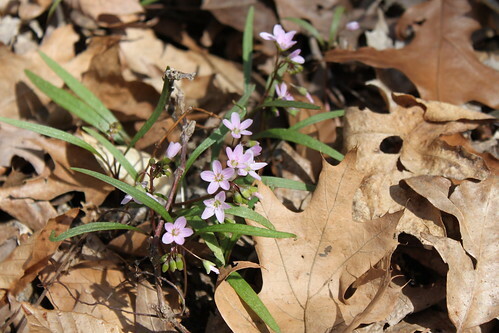 We hiked, slowly and with many stops, around Highbanks Park today, studying wildflowers, birds, and the sound rocks make when thrown in streams. We shared dinner with my parents and sisters, Alex's parents and brother, and two of my grandparents. 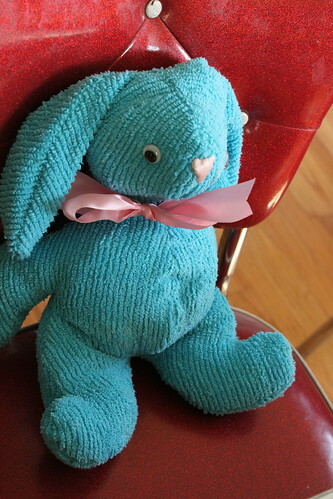 Lil was showered with more gifts including the bunny above, hand sewn by my grandmother. Our faces are sun kissed and the floor inside is muddy. 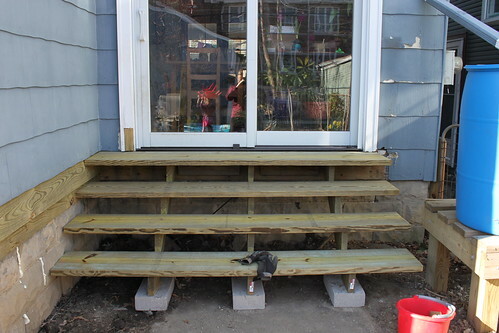 Dirt and seeds have new homes as we have new stairs to walk upon. It was a great weekend. How was yours?